Our company is always looking for exceptional people to join the Venterra Realty Team. 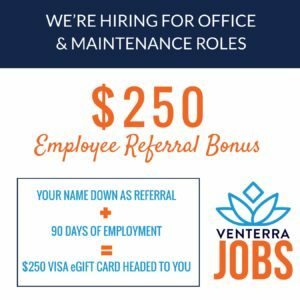 You can make a great impact on our organization by referring amazing individuals to become a Venterra Employee. What a great way to put some extra cash in your pocket while making a difference in someone’s life! Check out all of our currently open property management jobs! In order to be credited as the referrer your applicant will need to select “Referral” in the “Source” field on their application under the “Where is the first place you heard about us?” section and will need to include your name and email address in the “Referred By” field as shown below. Thanks in advance for helping to do your part to make us an even better organization by sending great people our way!